It owes its origin to Mrs. H.T Wills who established the choir in1906. 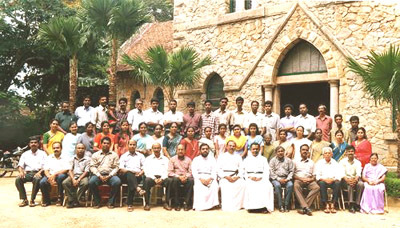 The Choir has the reputation of popularizing English Hymns, Malayalam lyrics and has made pioneering contribution in the promotion of Church Music. Today we are fortunate to have a Malayalam Service Choir, Tamil Service Choir, English Service Choir and Junior Choir. While the language Choirs lead music in the respective services, Junior Choir is an endeavor of the Church to nurture young music talents for the future needs of the Church. Summer School of Church Music,an institution for music education Started by the Church in 1957 by the then organist Sri Albert Joseph, is a source of inspiration for youngsters to learn fundamentals of vocal and instrumental music. Over the years this initiative has provided training to more than 2000 persons. The Choir visits rural congregations, and mission fields as witness to Jesus through songs. Services held with the partnership of other Churches is an acclaimed means of evangelism through music. An annual event, held regularly to visit two or three Churches share their experiences and to learn from them. Retreats are occasions for its members to be free from their burdens and to learn the word of God and meditate on it. Membership - is open to any Christian who is willing to abide by its rules, and regulations. A senior citizen's fellowship is organized by the elders of the Church to uphold and encourage one another and involve themselves in the missions of the Church in all the ways possible,i.e., to pray fervently and testify Lord Jesus. Each gathering is guided by pastors and eminent persons are invited to talk and deliberate on relevant matters of interest. This is a great opportunity for those who have retired/ completed fifty-five years to put in their talents and experiences gained over the years, for the betterment of fellow believers and the Church. 4:30 PM Thursday - Weekly fellowship meeting. 5:00 PM Third Saturday - Monthly working committee. History tells that erstwhile YMCES was started in 1907 by our young men Mr. S.I. Sumanam, Mr. Joseph Retnam,Mr. Bonus Isaac and Rev. J.W.Rasalam. This youth ministry is an able arm of the Church enabling in its evangelistic pursuits and social commitments in a big way. The youth of the Church in the past were instrumental in starting Sunday school, building Churches, constructing houses to the poor and showing the elders in many ways of exemplary stewardship. The YMCES, YWCES, BCES & GCES have merged together as CEYF. An organization for women to come together to pray, to learn the word of God and to share it with others was started in the year 1935 by Mrs Burchart a missionary. Mrs R.Moses was the founder Secretary and the meetings were held at the LMS Bungalow, later on shifted to the Church. At present, the fellowship is chaired by the wife of the Pastor - in charge and is held as biweekly meetings on every Wednesday evening at 4:30 pm, and Sunday after Morning Worship at 10:15 am. First Wednesdays dedication, second testimony and prayer, third Bible study and the fourth are devoted to special meetings. Visiting the old and the sick is one of the ministries carried out diligently by its members. Family week: One Sunday in the year they observe as family week to bring home the role of Women-in the Family, Church, Society and Worship services in the Church. Social Services: A food processing unit for the benefit of poor women to provide supportive income to their families is one such self employment services. A home was built and donated to a poor woman.It is a proof of their service to the poor and marginalized. Classes on every aspect of life in Christ are arranged for people up to 35 years with a well planned syllabus and taught by dedicated teachers of time tested credentials. The motto is "Train up a child In the way he should grow and when he is old he will not depart from it ". This Sunday school was started before MM Church was dedicated in the year 1838 by Rev. John Cox at Kannanmoola and later on it was shifted to MM Church. At present Sunday school has two sessions, morning and evening. 10:00 AM Sunday at Church Hall and its Premises. World Sunday School Day - Is celebrated every year in solidarity with the Sunday school movement world over to commemorate the starting of the movement by Robert Rakes. Vacation Bible School - During summer holidays the students are imparted Bible Knowledge in a structured way based on a theme identified for each year. This is a semi- informal participatory learning. Annual Day and Fancy Sale- Two occasions exclusively for exhibiting the talents of the students and to encourage them with rewards for their skills in Bible learning. Fancy sale gives an opportunity for the students to learn to give for the Church cheerfully and to make them generous and charitable. Gospel Band of M.M.Church was mooted in 1972 by the Pastor Rev. A Issac and Mr.Justin S.Jesudasan, the Secretary of the Church Committee. A Subcommittee consisting of Messer's. N.Yohannan, A.Ponniah, Justin S.Jesudasan, H.Fletcher, Peter Jacob John and Rev.A.Issac was authorized to explore the possibilities of organizing a gospel band to assist the Church in the propagation of the Gospel. A beginning was made by constituting a team of dedicated members under the guidance of Rev. A.Issac, in the context of celebration of the festival week of the Church from 21st January to 27th January 1973. A proposal on the constitution of a gospel band was presented at a meeting of the congregation held on 25-2-1973 and patron of the Gospel Band Rt.Rev.I.Jesudason, the then Moderator's Commissary, presided over this meeting. The activities of the Gospel band include hospital visit, visit to the sick and bereaved, holding cottage prayers, helping the poor and sick, giving financial aid to poor churches, conducting open air gospel meetings and conventions meeting. Notable achievements of gospel Band for the glory of our Lord are the establishment of the CSI churches at Nemom and at Lenin Nagar in Trivandrum. These two Churches were taken up as outstation projects and now they have attained the full status of full-fledged Churches. In the year 1910 Sri.G . Bhagyadas, Henry Devaram, Baylis Paul and few others started this under the patronage of Mr. P Ganabharanam. Mr. Dennis was its founder President. The main aim is to train the boys literally, spiritually and religiously to make them realize their responsibilities towards their families, Church and the nation. Boys under 14 belonging to the Church are groomed to be leaders and worthy citizens. Weekly Meetings - Sundays after morning worship service. Bible learning - Through discussions, elocution, quiz etc. the boys are equipped in the knowledge of the Bible..
Sports and Recreation - Amble motivation training is imparted to develop skill. Annual Competitions are held to encourage them.
" Be strong and courageous. Do not be afraid or terrified because of them, for the LORD your God goes with you; he will never leave you nor forsake you."